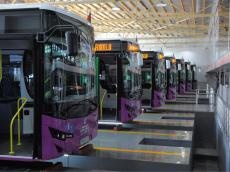 Some 70 passenger buses with Euro 6 engine will be delivered to Baku, Xaliq Faiqoglu LLC told Trend on Oct. 11. The delivery will be carried out in the framework of the company's cooperation with the European Bank for Reconstruction and Development (EBRD), in connection with which an agreement was signed on July 12. The company's buses, which are currently in operation, already have Wi-Fi services, and in the near future, passengers will be able to use free internet in 164 buses.